Hi friends! 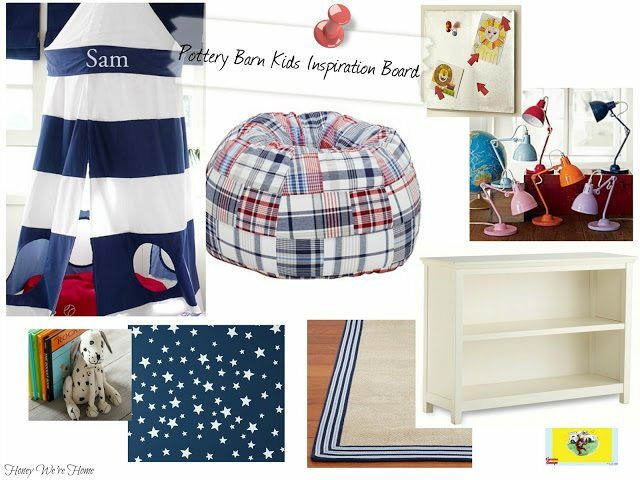 As a huge fan of Pottery Barn Kids and PBS Kids, I was delighted to join in a Reading Nook challenge where I was asked to create an inviting kid-friendly space in my home with Pottery Barn Kids goodies. 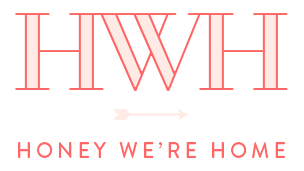 Five other bloggers are participating also and YOU get to vote on the Book Nook you like best. 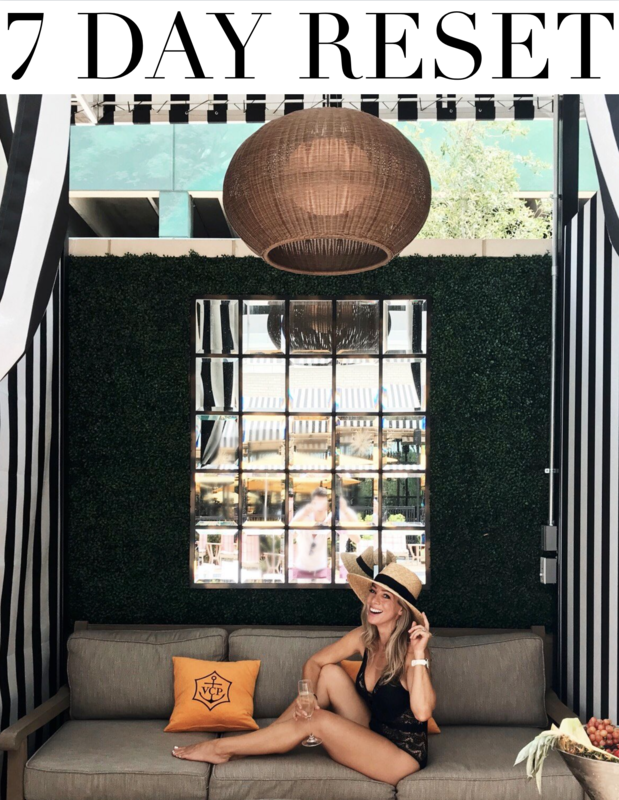 The blogger who created the winning space will get to give one of her readers a $500 gift card to Pottery Barn. 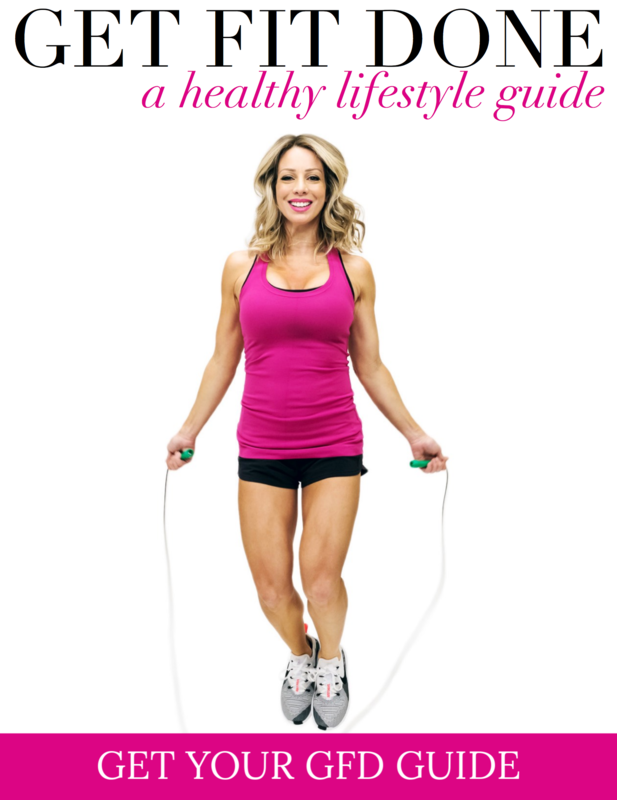 I hope y’all like what I’ve created and that one of YOU wins the gift card! You can cast your vote on Pottery Barn’s new blog, Building Blocks. 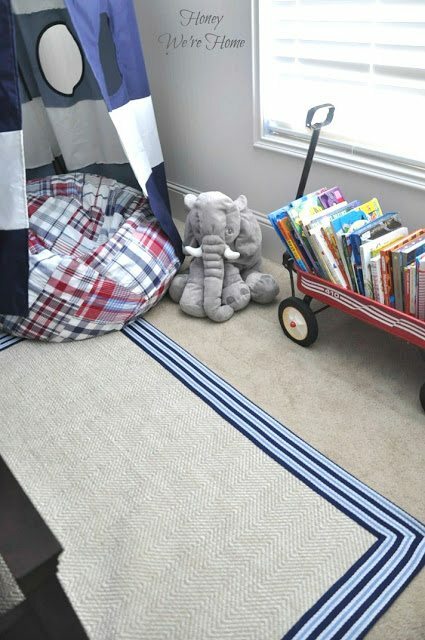 And after incorporating the items from Pottery Barn Kids, he now has a perfect little reading nook to call his own. The inspiration for the reading nook began with the blue and white stripe Rugby Play Tent Canopy. Not only is it a super-cool place for a kid to hide away for some reading time, it makes a bold statement in the room. It’s made of durable polyester and is really sturdy. We hung it from the ceiling with a small hook. 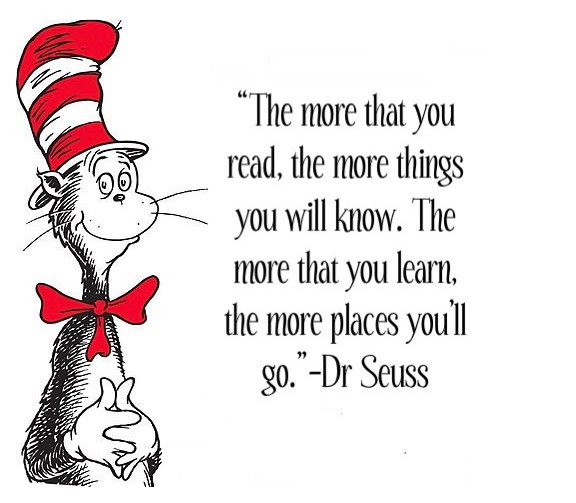 A Dr. Seuss quote fits well with the space and is framed just outside the canopy. I simply printed it from my computer. Instant, inexpensive art! For cozy seating, inside the canopy is the Red Madras Anywhere Beanbag. James is about 3 feet tall and fits this chair perfectly with room to grow. The Chenille Jute Stripe Border Rug ties it all together and is really soft. I added some pieces from our own house to the nook as well. We are fortunate to have an old (vintage??) red wagon that belonged to James’ dad as a kid that is still in pretty good shape for being over 30 years old. After a good washing, it doubles really well as added book storage. 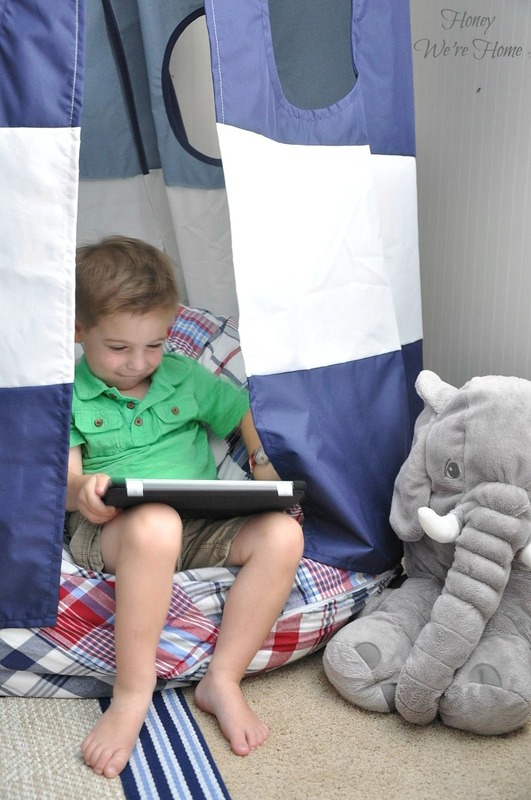 The big star bucket holds extra pillows and blankets for super cozy-time inside the canopy. Opposite the canopy is the Pottery Barn Cameron bookcase in white. I’m so pleased with the quality of this furniture- it has a sold wood frame and was easily assembled in about 20 minutes. I like to keep books as well as colorful decorative objects in the bookcase for added visual interest. The bookcase holds lots of books and I included a wire basket that can easily corral the smaller board books. Making a label that James can “read” was easy with computer clip art and a laminating machine. It also makes clean up easy since James knows exactly where the small books belong. 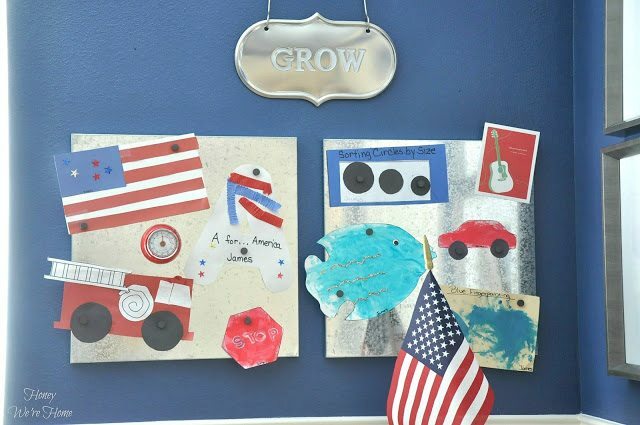 The Galvanized Magnetic boards are perfect for showcasing James’ current art projects and I love how doubling them up increases the impact in the room. The “GROW” sign is meant for a garden, but I thought it was completely cute and appropriate for a child’s room. As you can see, James loves his little nook and “reads” in it everyday. He even watches his PBS Kids shows on the iPad in there. We especially love Super Why and I swear it has given him a head start on learning to read. I hear the catchy ABC song in my head as I type . . . It looks fantastic Megan! And so little boy!! Instilling the love of reading in a small child is the best thing you can give them. Good Luck with the contest. Well, yours is my favorite, of course! I was going to list everything I love but realized I love EVERYTHING! Amazing room! Lucky boy! Loving all of the colors! That ceiling is incredible! And the wagon is just so darling! Great product picks, you really put together a great little reading corner for James! The wagon is a wonderful idea! Love it! I voted for ya! I have got to get that tent canopy for Dacen! I'll definitely be placing an order for one this week! Thanks for sharing! You're awesome at organizing shelves! Come help-I'm having a panic attack over mine! Megan this is absolutely adorable! You did an amazing job! I love the little details you added, and that wagon! What a treat that he has something that was once his dad's. Love it! 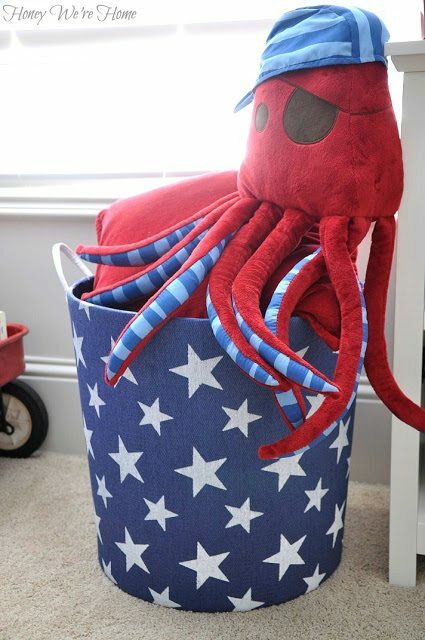 Where did you get that awesome star bucket? I love the whole room especially the paint color!!!! 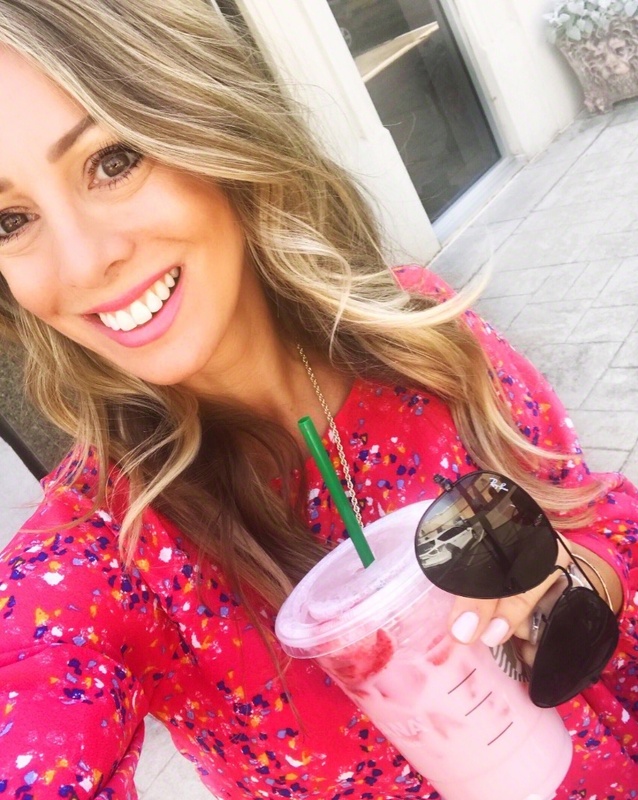 Danielle, that star bucket is from HomeGoods! James must be so thrilled with this. 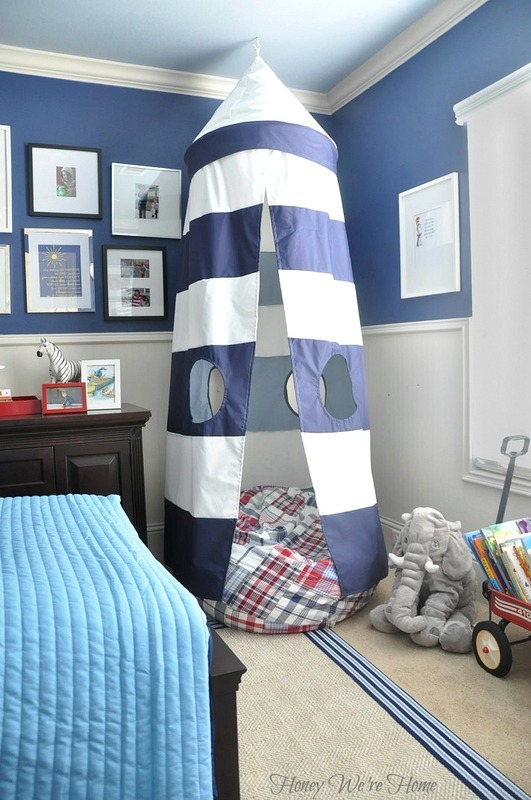 That canopy tent is the coolest thing, such a whimsical addition to a little kid's room! What an awesome space you created!! Well done mama! The whole room is beautiful. Love it! I love it! it came out so cute. The canopy is adorable as is the wall art and the bookcase. so very cute! That corner is the cutest thing!!! Love the mix of madras and stripes…and it looks amazing with the rest of the room!!! That will surely be his fave spot for years!! Great job, sweets!! 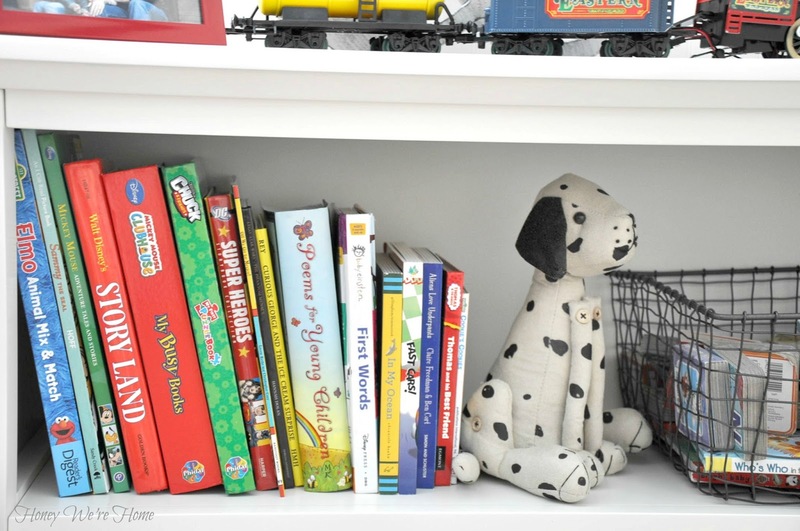 I love the cute little nook you created! And now I am singing the ABC song from "Super Why" in my head as well….my son loves that show. Love it! The whole red, white and blue theme is so fun, boyish…and patriotic! Looks great! Oh Megan, this is a perfect boy's room! 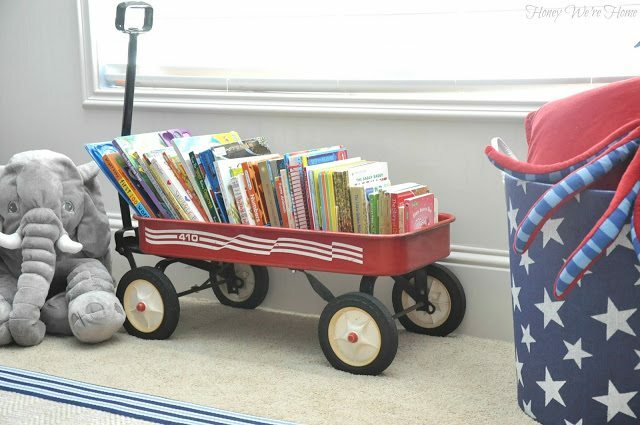 I especially love those books in the wagon. Just darling! It looks great!! I love all the details in the room!! I voted for your room — it looks great. Good luck! Oh, Megan. It's amazing. What a fun and cozy corner. 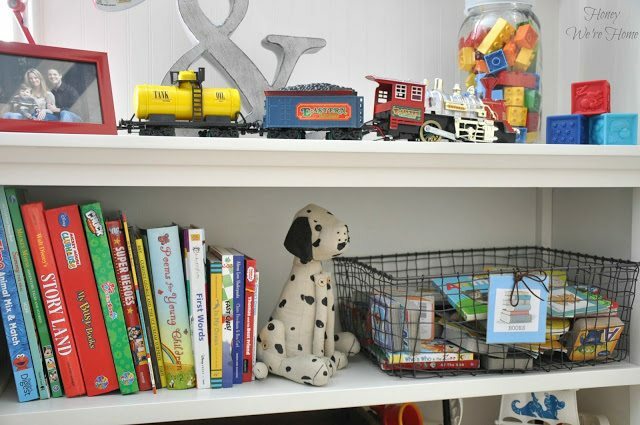 I just love the "grow" sign and all of the details styled on the bookcase. He is so sweet. 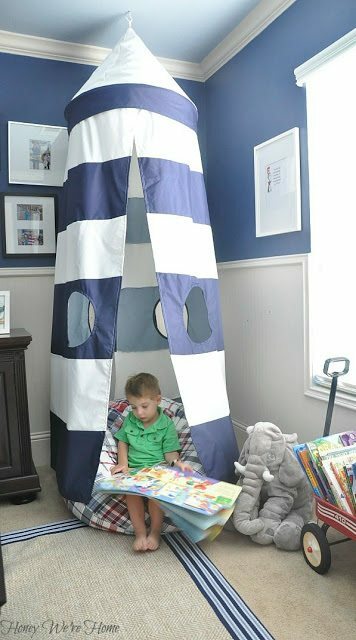 I think all kiddos should have a special spot to get lost in books. Oh that is just the cutest reading nook ever! I went over and voted, everybody came up with such great ideas. What a wonderful way to encourage reading. Such a perfect, cozy space for your sweet little one! Love the stripes and madras and adore the wagon. I love this! 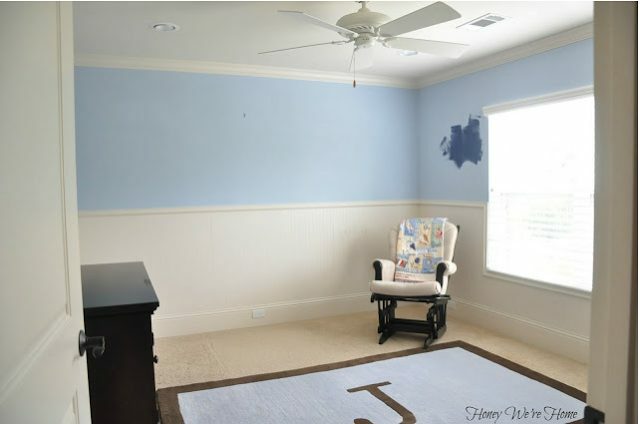 What is the paint color you used in his room? It is the perfect shade of blue! It looks AMAZING!!!!! Great job Megan. I voted for your room. It's stunning to say the least. Stunning is all I have to say. I voted for your room of course! I ADORE this room! It has all the colors I've been thinking of for my growing boy's new bunkbed room. 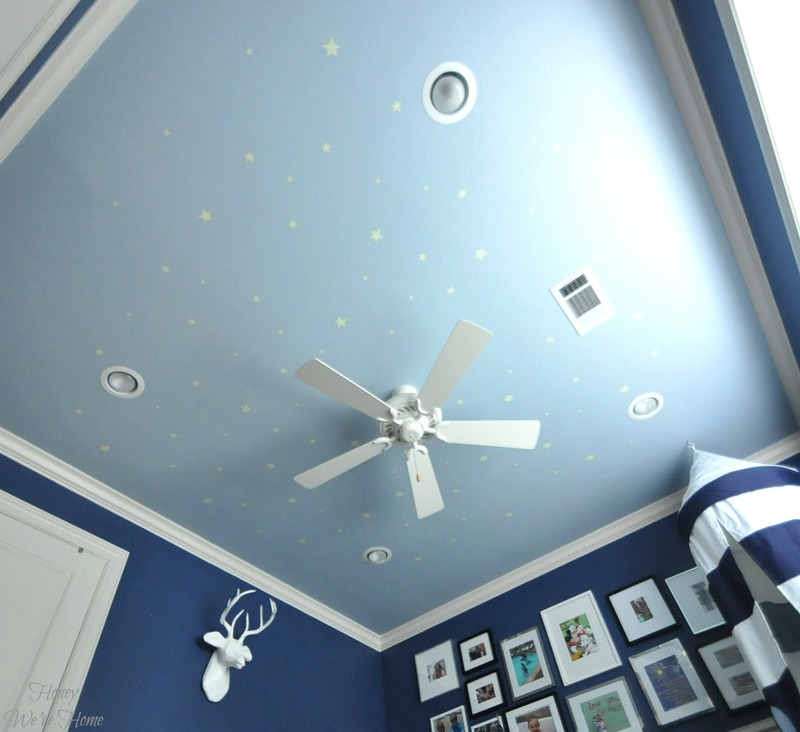 I was just telling him about sticking some stars up on the bottom of the top bunk so he could see them at night, but I like the ceiling idea so much more:) Going off to vote! Just voted for you!!! You did an amazing job!! I love the colors and how everything is put together. Hope you win!! I love this reading corner! 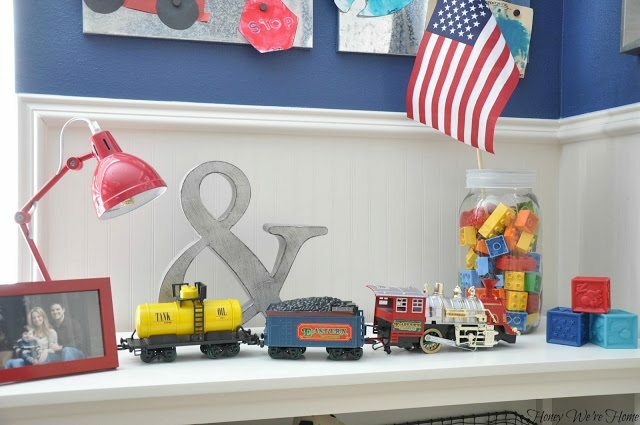 I may need to borrow some of these ideas when we re-do my son's room. Where did you get the wire basket that is on the bookshelf? This space is awesome, you did a fabulous job! I am going to have to do this in my grandson's room. I keep him 4 days aweek and this would be perfect in his room, here at at his house! Love the wagon!!!!! 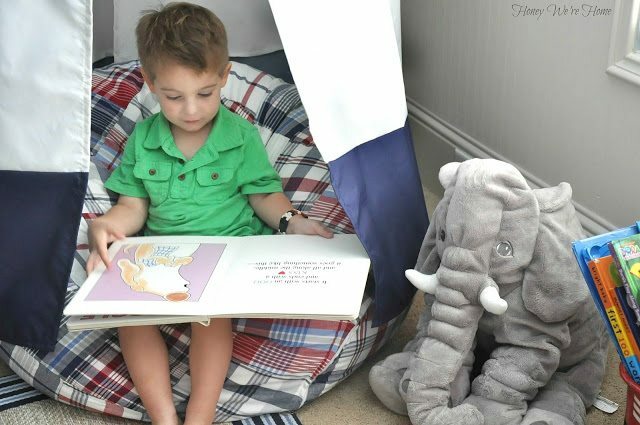 What a wonderful reading nook for James you have created Megan! It's such a fun boy spot! I love it! He is adorable sitting there reading. Love the books in the red wagon. That elephant is so cute! This space turned out so great! Love the color combo and that wagon is too precious – how special. Love that nook and love the idea of using the red wagon flyer for book storage! I love this look, and I am getting the canopy. I was curious as to the paint color you used for the blue?… Thanks! The nook and the whole room are adorable! I love the stars on the ceiling, red wagon, book shelves and the stars bucket together with toy octopus! 🙂 Lovely! Oh wow I just adore this room!! 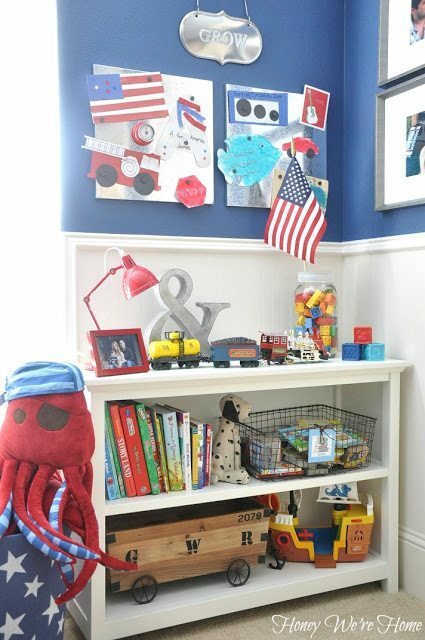 Creating my sons big boy room now and this is so inspiring – thank you! Can I ask what the blue paint color is on the walls? I've searched for so long and this blue is literally PERFECT! Thank you!